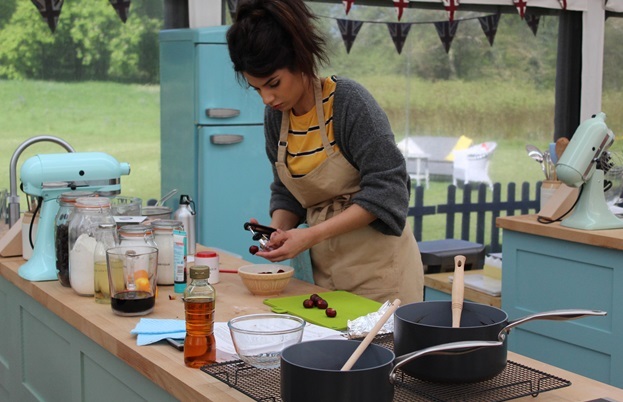 The second week of Great British Bake Off saw the eleven remaining contestants tackle cakes, with plenty of triumphs and mishaps. 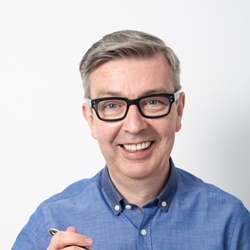 Howard Middleton gives us the lowdown of what went on. Week two in the tent and the heat is on. 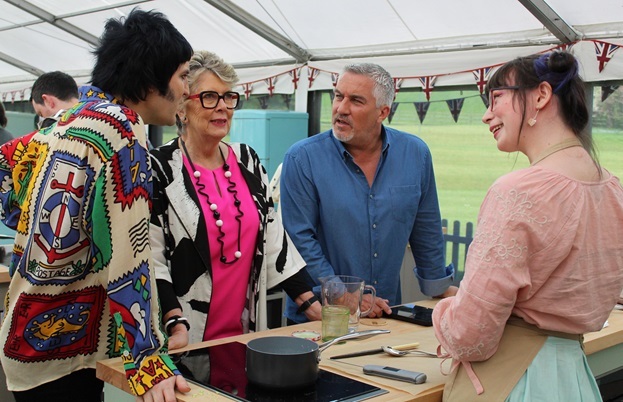 We’re told it’s ‘one of the hottest days in the Bake Off tent ever’ and poor Noel is introducing cake week in the full crinoline and powdered wig of Marie Antoinette. For their signature challenge, Paul and Prue are looking for a tray-baked cake that’s cut into sixteen identical slices. Antony and Briony seem to have ventured somewhat off the cake-based brief, as they’re both constructing their creations on a layer of pastry. Antony’s cardamom and coconut burfi bake is likened to an Indian Bakewell tart. Briony’s is more Spanish with its orange pastry base, almond sponge and almond turrón. 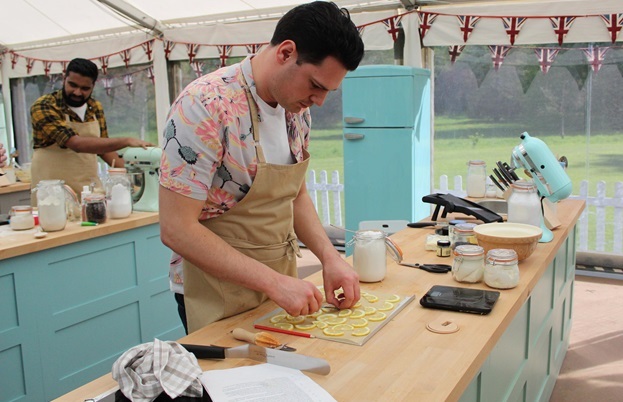 Neither score highly on appearance – Paul decides Antony’s slices are ‘a bit of a mess but a pretty decent traybake’ and he says that Briony’s bakes ‘look hideous’. However, taking a bite, he blissfully admits he doesn’t care how they look and Prue adds ‘they’re divine’. 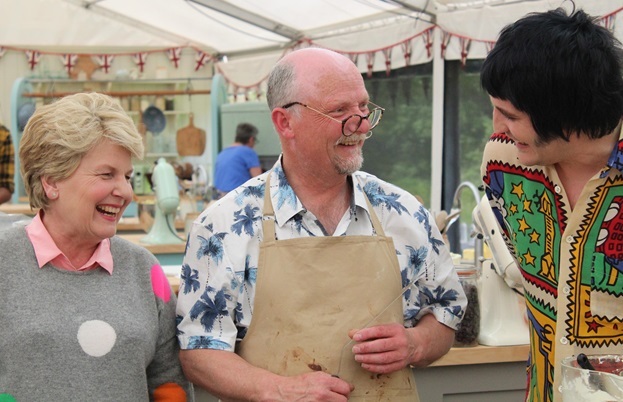 Paul judges Luke’s lemon and poppy seed traybake to be ‘tough as old boots’ and Prue adds the white chocolate and mascarpone topping is ‘sloppy’. Last week’s Star Baker, Manon isn’t having such a stellar second week. Her rosemary, honey and fresh fig cake has no raising agent, other than briskly beaten eggs, and it fails to take off with Paul. He says it’s ‘quite a tough sponge’ and ‘a bit bland’. Jon’s rosemary-flecked lemon meringue traybake fares better. Though the judges decide it’s lost some of its elegant touches, they agree it tastes ‘delicious’. Rahul’s engagingly Eeyore-like pessimism leads him to anticipate he’ll run out of time before he’s even started. Ambitiously attempting a double-layered lemon joconde sponge with Italian meringue buttercream, he drizzles the cake with cardamom syrup and worries it smells like disinfectant. Kim-Joy is also employing a ‘clean, green’ ingredient with her pandan-flavoured chiffon cake. Paul winces at the pandan’s grassy smell and laughs, ‘It’s like I’ve just cut me lawn… it’s like I’ve just cut me lawn!’ Paul clearly thinks this is one of the funniest things he’s ever said. In fairness, he’s drawing from a pretty limited back catalogue. Whilst Paul’s still smirking at the prospect of a new career in comedy writing Prue admits she loves the cake. With only fifteen minutes to go, Terry claims ‘I’ll have to caramelise my nuts a bit quicker’. They’re dropped atop a rum, raisin and apple cake with dark chocolate ganache. It’s judged to be ‘very rummy’ and the final verdict is ‘not very sophisticated but a real pleasure to eat’. Karen’s almond traybake includes rhubarb jam and custard royal icing. Finished with a generous layer of sparkly striped marzipan, Prue says it looks great but ‘the marzipan is too thick’ and Paul adds ‘the sponge is very dry’. Ruby and Dan are both using Black Forest Gateaux as their inspiration. Hers has a dark chocolate ganache and a white chocolate drizzle. Despite being judged to be a ‘very good chocolate cake’, Paul adds that it looks messy – ‘like a forest floor’. Dan’s version has kirsch-soaked cherries, a vanilla cream topping and tempered chocolate decorations, which he pipes onto acetate with fastidious fervour (and a piping bag). Illustrating the fact that this cake was his ‘absolute favourite as a boy’ we’re shown a photo of young Dan with chocolate cake, then a less corroborating shot of him dressed as a caveman. Dan implores Paul to ‘say something nice’ but the judge simply offers his hand – the first shake of the series. Returning to Rahul, Paul likens his elegant slices to wholemeal finger sandwiches… but there’s no handshake, despite the fact they ‘taste beautiful’. Prue offers the bakers some words of advice about her technical challenge, ‘Go like the clappers – you don’t have much time’. Based on Claude Monet’s birthday treat, Le Gateau Vert is an unsurprisingly green cake, surprisingly made so by squeezing handfuls of spinach. The bakers need to get a sponge of sufficient height to slice into three layers. Karen scuppers her chances by not separating her eggs so has to start again… as does Dan… and Luke… and Terry. Strewn with edible flowers, the green-fingered bakers achieve a diverse display of floral artistry. Karen optimistically claims hers is ‘a little ring of beauty’ but she sadly takes the bottom spot. Jon, Rahul and Dan blossom at the top. Moving on to the showstopper, Prue helpfully says, ‘Nobody in their right mind would be dealing with chocolate on a day like this… but this is Bake Off and they’re going to have to.’ Tempering as the temperature’s rising, it isn’t surprising that the bakers struggle to produce the required two-layered cake with chocolate collar. Jon comes up with a literal interpretation of the collar, basing his design on one of his trademark Hawaiian shirts. Antony fashions his pistachio, saffron and rose creation with saris as inspiration. A crisp collar of neat raspberry and dark chocolate stripes finishes off Dan’s cake, whilst Kim-Joy’s yuzu and raspberry genoise has fondant cats chasing ribbons. Gallic Manon’s fondant figures are less actively inclined. 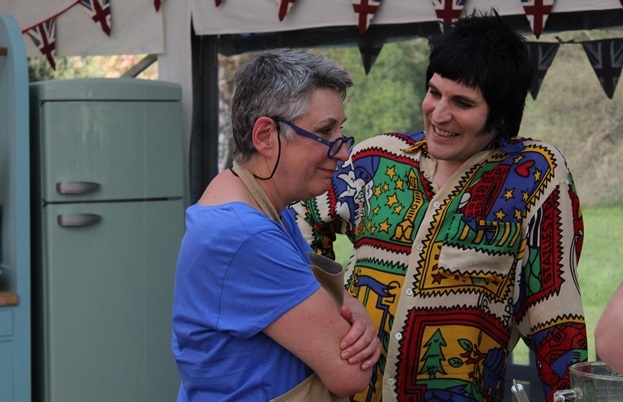 She tells Noel and Sandi that the princess on her almond cake is ‘pissed off’ by the sleeping prince. Pardon her French. Karen’s strawberry and chocolate cake is decorated with the lyrics of Strawberry Fayre. As Karen gamely sings the tale of a fair maiden offering the contents of her fruit basket, Noel says it’s ‘basically about a prostitute’. Briony claims her chocolate fudge and salted caramel cake is ‘still raw’ after baking longer than she has at home. The show’s oven suppliers are probably getting hot under the collar. Briony remakes her cake. 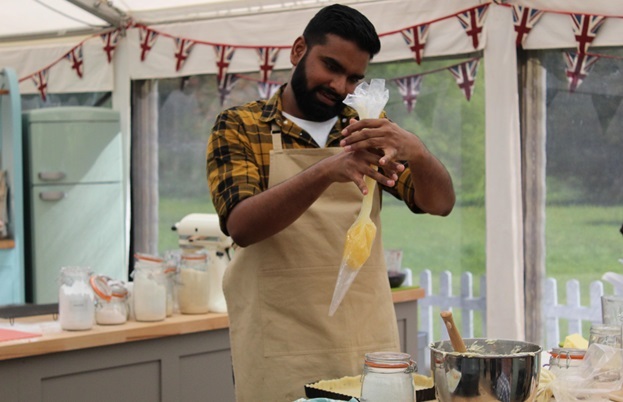 Rahul offers Paul a detailed account of the different properties of crème au beurre versus Swiss meringue buttercream and how he’s employing the two in his intricately decorated Bengali-inspired cake. Ruby takes a contrasting approach with a freestyle white chocolate collar that she says inspired by Jackson Pollock. It has potential disaster written all over it but it turns out to be anything but. Meanwhile Terry’s ambitious recreation of the Eiffel Tower is toppling in the heat and Luke is regretting crumb-coating his cake with double cream and white chocolate. His Art Deco collar melts and refuses to stick as it should. At the judging table Jon’s ‘tender’ pina colada sponge is lauded, and his bold collar ‘looks amazing’. 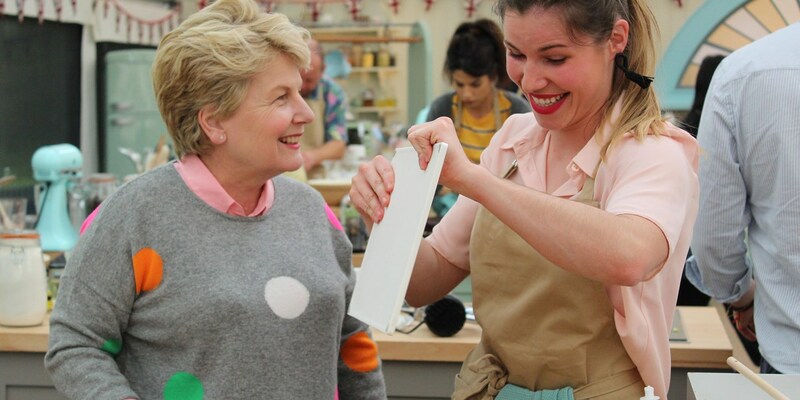 Despite leaving the collar’s acetate still in place (which, having now set, Paul showily peels off), Manon’s cake is judged to be ‘smart’. Terry’s unfinished architecture is still admired, though Prue says his cake is ‘a bit boring’. Briony’s cake is ‘overbaked’ but Prue adds ‘the flavours are lovely’. Antony’s ‘amazing colours’ wow the judges but they think the saffron has overpowered the subtle flavour of pistachio. Kim-Joy’s sponge is ‘slightly dry’ but they can’t fault Karen’s ‘really lovely’ cake. Luke’s flavours are ‘delicious’ but his cake is ‘tough’. Dan is applauded for having done an ‘amazing job’ and his cake is assessed to be ‘rich and moist’. Paul has never done his handshake thing in a showstopper challenge and Rahul hesitates when he’s beckoned closer. Concerned that he may have left a cocktail stick in the ‘unbelievable’ cake, he discovers he has nothing to fear but the sweaty grasp of a Hollywood palm. You wait nine years for a showstopper handshake and then two come along at once. Ruby’s ‘just delicious’, ‘elegant and restrained’ creation gets the second hand accolade. Sadly it’s my fellow Sheffielder, Luke who gets the boot this week, whilst Rahul is handed the title of star baker. Rahul worries he may have peaked too soon, but then Rahul looks worried about everything. Bless.